Our Med Spa offers Advanced Skincare offering Micro Needling, Dermaplaning, Microdermabrasion, Chemical Peels and more. THE DERMAPEN FRACTIONAL MICRO DELIVERY PROVIDES UNPARALLELED COLLAGEN INDUCTION VIA FRAGMENTED DELIVERY OF NEEDLES INTO THE EPIDERMIS AND DERMIS. THESE MICRO INJURIES TO THE SKIN ENCOURAGE AND HARNESS THE POWER OF THE BODY’S INNATE ABILITY TO RE-GROW AND REPAIR THE SKIN THROUGH THE PHYSIOLOGY OF COLLAGEN INDUCTION. Micro Needling offers a solution for all skin conditions that clients might seek treatment for: wrinkles and fine lines, acne scarring, stretch marks, wound healing stimulation, and skin tightening, lifting and rejuvenation. Micro Needling treatments complement other treatment options such as chemical peels, IPL, Micro-dermabrasion and laser skin tightening. This will greatly increase their effectiveness. Dermapen is a unique microneedling device that has quickly become the innovative Leader in Anti Aging treatments. Dermaplaning is a skin resurfacing procedure that improves the skin’s appearance by removing the top layers through a method of controlled scraping of the skin. This treatment helps to diminish the appearance of fine lines, uneven texture, and provides a healthier more radiant complexion. 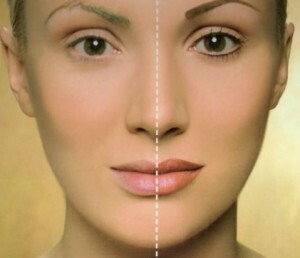 Dermaplaning is typically done immediately before a chemical peel and allows the peel to work more effectively. By removing the outer layer of dead skin, the peel may be applied more evenly for a more dramatic result. Dermaplaning can be used on small areas of the skin or on the entire face and also removes vellous hair “peach fuzz ” which traps excess dirt and oil without growing back thicker. It improves scarring and smooths out small facial wrinkles leaving the skin refreshed, polished and glowing without visible irritation. Dermaplaning increases product penetration and can be done monthly! 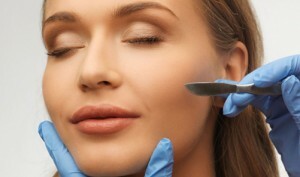 Dermaplaning is safely performed by using a sterile surgical blade. Don’t let the word blade overwhelm you, this is a very safe and effective skin rejuvenation treatment and can be compared to shaving. Your certified aesthetician holds your skin taut while stroking the blade against the skin at a 45 degree angle. This particular medical spa treatment is relatively quick and painless. WILL MY HAIR GROW BACK THICKER? This is a common misconception and is completely false. It is physiologically impossible for hair to grow back thicker. We have two different types of hair on our bodies Vellous hair and Terminal hair. Vellous hair is most often located on our face and appears to be almost translucent or blonde. Where Terminal hair is much thicker and grows mainly on our under arms, pubic area, and eye brows. It can also be found on men’s legs and lower facial area. When Vellous hair is removed it grows back the same texture and color it was before the Dermaplane treatment. This is why we recommend Dermaplaning every 4 to 6 weeks to keep up with your natural hair growth cycle. Terminal hair will grow back the same as it was before…. coarse. If you have unwanted terminal hair that you never want to come back we do offer Laser Hair Removal treatments that can do just that. Add a glowing finish to your custom facial with an Oxygen Infusion. It calms inflammation, kills bacteria, drives anti-oxidants and vitamins into the skin, helping your skin to feel energized and younger looking by providing oxygen directly to skin cells. TRI-CHLOROACETIC ACID (TCA) IS ONE OF THE BEST ORIGINAL SKIN REJUVENATION PEELS FOR PEOPLE WHO WANT TO IMPROVE MODERATE TO SEVERE SUN DAMAGE OR THE SIGNS OF AGING. Designed to significantly improve the appearance, tone, texture and condition of your skin. This technique will to help restore wrinkled or blemished facial skin. A special solution is applied to the skin to peel away the top layers of skin. During the healing process a fresh, new layer of healthy surface skin is formed. The new skin will appear smoother and finer with a more even pigmentation. A medium strength peel which consists of multiple peeling agents. These agents penetrate deeper into the skin and result in greater exfoliation of the outer skin layers. This peel is designed for more extensive damage than AHA’s can improve. This medium strength beta peel can successfully address a multitude of skin concerns such as inflamed acne vulgaris, fine lines and wrinkles as well as an uneven and blotchy skin tone. This is one of the Alpha Hydroxy acids (fruit acids) peels. Fruit acids are nontoxic, naturally occurring substances, and are found in a variety of fruits, such as grapes, apples and sugar cane. Be sure to read more about the benefits of each peel we offer. This relaxation of a facial combined with medical grade products facial cannot be found in a regular day spa. Boca Med Spa uses the latest in medical products and therapies to reverse signs of aging, sun damage and acne, while enhancing your skin at the cellular level. As it is the main focus of our skin care treatments to achieve exceptional maximum results. This level of treatments allows for the most progressive protocols, technologies, and medical grade products. Each treatment involves a customized protocol of skin analysis, deep pore cleansing , exfoliation, steam scrub massage, extractions, peptide hydration, and sun protection for a healthier complexion.. This is a treatment for anyone with back acne. This treatment includes deep cleansing, steaming, scrub massage, extractions and a peel that softens hardened sebum, controls oil and lifts superficial scarring. Excellant for those experiancing excessive oil glands and blemishes. Suggested for those experiencing clogged pores, oily skin, milia or blemishes. This treatment includes microdermabrasion, deep pore cleansing, steaming, facial scrub massage, exfoliation, extractions, claming treatment serums and is finished with an oil free sunblock along with a custom treatment plan. 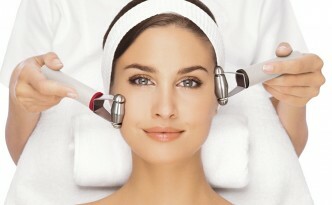 Add a glowing finish to your custom facial with an Oxygen Infusion. It calms inflammation, treats acne, kills bacteria, drives anti-oxidants and vitamins into the skin, helping your skin to feel energized and younger looking. WHAT IS THE PRINCIPAL BEHIND MICRO NEEDLING? The idea behind CIT is similar to that of many other non-surgical skin-tightening procedures in that it aims to create a controlled injury underneath the skin’s surface, thereby inducing the body to respond through the formation of new tissue layers of elastin- and collagen fibres (neo-collagenesis) as well as new capillaries for an improved blood supply (neo-angiogenesis) in the treated area. The skin plumps and thickens in response to this stimulus, ultimately reducing the appearance of scars, and fine lines and other skin texture changes. In addition to CIT, the channels made from the micro-needles allow topical gels and creams to be absorbed more effectively through the top layer of skin. WHAT ARE THE EFFECTS OF MICRO NEEDLING ON THE SKIN? It improves the thickness of the dermis as well as the epidermis. This in return improves skin texture and reduces wrinkles. It also has a positive effect on hyper-pigmentation as well as on hypo-pigmentation. Disfiguring scars, especially acne scars, can many times be improved. New collagen fibres can elevate the depressed scar tissue. An improved blood supply (neo-angiogenesis) into the previous fibrotic scar tissue harmonise and blends the pigmentation with the periphery skin. Micro Needling is a revolutionary technique which has the amazing ability to naturally stimulate collagen and elastin production in the skin with the following benefits. This is one of the most popular non-surgical cosmetic procedures today! It is a skin rejuvenation technique that helps repair skin that is damaged from the sun, acne or the effects of aging. 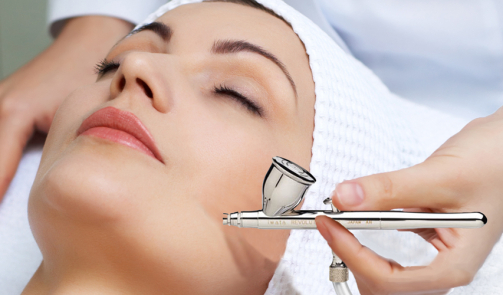 Microdermabrasion also stimulates the production of collagen and removes dead surface cells. Microdermabrasion softens and modifies fine “expression” lines on the forehead and around the mouth, polishes and reduces fine lines on the cheek, smooths pigment changes or skin discoloration, reduces large pores, and polishes and smooths acne scars. This treatment begins with a deep facial cleansing, followed by microdermabrasion, steam scrub massage, extractions are performed along with a peptide and anti-oxidants hydration treatment, finished with SPF for perfection. As a result, this technique combined encourages the production of a new underlying layer of skin cells with higher levels of collagen and elastin; reduces or eliminates fine facial lines, acne scars, and hyper-pigmentation. Deep pore cleanings scrub and extractions are proformed to remove dirt, bacteria and blackheads, this technique helps to clean pores and minimize in size. The effects of microdermabrasion and chemical peels include better skin color and texture, and reduce the visibility of acne, age spots and sun-damaged skin. ALSO CALLED MICRO-PIGMENTATION, NOT ONLY SAVES PRECIOUS TIME AND MONEY; IT CAN WORK WONDERS FOR YOUR SELF-IMAGE, GIVING YOU A MORE YOUTHFUL, REJUVENATED APPEARANCE. Permanent cosmetics is a great alternative for active people with a limited amount of time to apply make-up. A safe, natural looking way to look your best anytime and all the time. Wake up with perfect make-up every day… and keep it that way! Color can be matched to your skin tone and applied to scar area to match the surrounding skin so that the scar seems to disappear. Eyebrows, eyelash enhancements and lip color can be done to reduce the appearance of hair loss, scarring or disfigurement. WANT TO SAVE TIME AND MAKE YOUR LIFE EASIER? For these and millions of other women who desire to cover scars or just plain are sick of their daily cosmetics routine, permanent makeup has been the answer. It’s a type of tattoo method that can give you the look of naturally applied makeup for. They are benign, tiny out pouching skin which is normally attached to the skin underlying it by a stalk which is thin. Skin Tags often look like tiny pieces of skin that is hanging and normally occur in those sites where clothes rub up against any skin as well as areas where there is friction from skin-to-skin, for example as underarms, groin, upper chest as well as neck. Cutaneous skin tags are usually small and harmless skin growths. By using low levels of High Frequency electrical current only to the surface of your skin, making this a safe, non-invasive and fast treatment. Skin tags disappear on contact and won’t come back. Because there is no penetration through the skin, this treatment is virtually painless. At the very most, some patients may feel a slight pricking sensation. Here at Boca MedSpa, we use only professional; specially trained and certified clinical aestheticians to perform this advanced cosmetic treatment and we observe the strictest standards of hygiene. The disposable, sterile stylus tips are used only once to insure complete safety! Request a FREE Consultation today!